Our wine selection is made visiting French vineyards and meeting the producers. In the spirit of matching wines and their country, we are looking for genuine creations to prevent a standardization of wines and tastes. 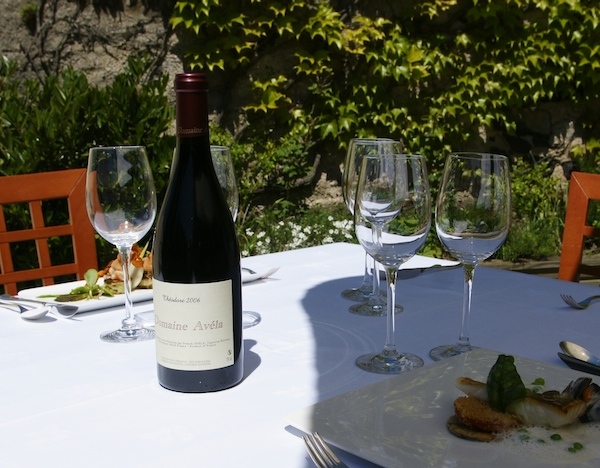 It is how our wine menu meets Gilles Moreau’s cuisine. Our list will seduce you with wines coming from different regions especially the South West region including Aveyron and the Languedoc region, as well as different producers whether new or old in the wine world. « Bio » (=Organic) wine is a European Label checked by 8 different organizations in France (Ecocert, Agrocert…). It comes from an organic farming, banning fertilizers or pesticides, using only copper and sulfur as treatments. It is a way to grow vines with respect of the environment, limiting the use of products in the wine and the vine. The standard of SO2 (Sulfur) allowed in this wine is limited to 150 mg/l for white wine and 100 mg/l for red wine. Biodynamic wines are based on organic farming, but the process goes further into the preservation and understanding of the environment. Biodynamic growing is first taking care of the soil itself. The idea is to find a balance between the soil, the plant and its environment (Fauna, Flora,...). It uses plants infusions (dandelion to strengthen the vine immunity system for instance, nettle, chamomile…), horn silica (to strengthen the internal structure of the plant), horn manure (to help roots and soil around the plant) …, according to the lunar calendar. It uses still sulfur and copper but in lesser quantities in comparison with organic farming. The standard of SO2 (Sulfur) allowed in this wine is limited to 90 mg/l for white wine and 70 mg/l for red wine. Natural wine is not a label recognized by the government but it is a vision shared by a few wine makers. The idea is to respect the living side of the wine, limiting the use of products to sulfur only. It is to avoid the standardization of the wine. It is made from organic farming or quite often a biodynamic process. For those wine makers, the grape is the only product to be used to make wine. It is thus a more fragile wine, respecting certain phases. The work of the wine maker must be precautious and precise (no brutal increase of temperature, no sudden manipulation…).